The Startup magazine took time this week to interview with Renat Isch founder of OriJeans. Our start-up is called “OriJeans” and we are producing made-to-order jeans that are hand-crafted from selvedge denim. Our web constructor allows customers to design and customize their own jeans to their individual preferences. We are using top-quality fabrics from the best American and Japanese mills. Our start-up, OriJeans, is aimed at everyone who appreciates style and quality – and specifically cool jeans made from selvedge denim. Also folks who want a garment that fits them perfectly and don’t have hundreds of dollars to spend on it. Our target audience is Internet-savvy and has no problem buying clothing online and waiting a little bit to get something special. First, we are strictly made-to-order, we don’t have a pile of jeans sitting around that we are trying to sell. Our customers will choose their own cut and then customize this choice by scuffs, rips and possibly spikes. Second, we’re focusing only on raw selvedge denim – no regular slub denim that you can find all over the place. Third, our buyers will customize their own jeans according to their dreams – and see their choices immediately to the virtual model displayed on their screen. Mike and Renat were students together at the University of Finance and Administration in Prague. One day they were having a coffee and got on the topic of quality clothing. One thing led to another and they decided to start a company to produce made-to-order jeans from the best material around – selvedge denim. Mike’s background is in construction management, which means he knows how to build things. Renat’s background is in project management, which means he’s a good planner. Both have always appreciated hand-crafted clothes…and they realized doing a start-up is the only way to realize their dreams! We’ve had this dream for about a year. At first we didn’t know what to do, and we’ve made our fair share of mistakes, but we feel using Kickstarter to help us get off the ground is really the right avenue for us. Also we have a great mentor, Carlos Gutierrez, he has a lot of experience with start-up and has been helping guide us. He loves jeans, too! Figuring out all the tax and legal stuff has been the biggest challenge so far. Partnership? LLC? Corporation? Tax liability? We got smart and decided to pay for some top-notch legal and tax advice and that has been well worth it. After one year we hope to achieve sales of 600 pairs of jeans per month. 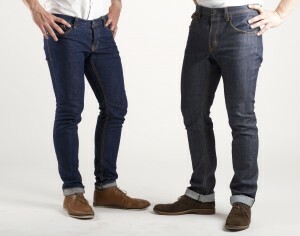 We hope the American market knows about what we offer and where to come for the best made-to-order selvedge denim jeans! When you get frustrated or confused or lost or just don’t know what to do next, you’ve got to realize that not everything can be solved by Googling. Sometimes you have to pay a real live professional for the best advice – especially on tax and legal stuff – so when the time comes don’t be afraid to pick the phone and actually call a human being and meet them and pay for it!